First Time Buyer Tips For Trade Show Displays | Displays and Exhibits, Inc. While appearance is important, there are a number of factors that should shape a first time trade show display buyer’s decision. From the type of information being presented to the target audience and environment, a great investment is more than the best looking display. With a wide variety of trade show displays available on the market today, first time buyers can find it difficult to narrow down their options. From space-saving solutions to eye-catching standouts, the spectrum of innovative display styles continues to grow and accommodate new and advancing needs. Understanding your brand’s goal (specific to each trade show) is imperative to choosing the right materials that will best maximize the return on each and every event experience. Whether that goal is long term and versatile or short term and promotional, with a little research, businesses can build their ultimate combination of displays to suit any purpose. The beauty of these branded display options lies in the brand’s opportunity to customize, all the while developing a booth space that is tailored to achieve the benchmarks set in place before attending. Creating a clear and concise message for the event is the first step in building out your trade show strategy, and similarly, should be the first step in deciding which direction to take your signage in. If that message is a constant, overall representation of the business, a large and permanent pop-up display type may be in order. 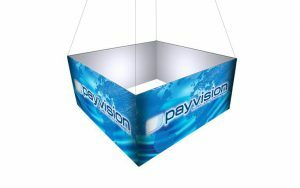 If your business’s goals for a particular trade show are based on a service, promotion or special, smaller or interchangeable banner types may be a better investment. If new products are the message themselves, showcasing them front and center with slatwall display types is the way to go. Knowing your audience is the second step to working the trade show floor (and marketing styles) in your brand’s favor. If they are a traditional audience attracted to big, graphic messages, modular displays can be the right way to project your designated message. If the audience is tech-savvy on the other hand, incorporating iPad kiosks into the booth design can be a smart move to attract more attention, buzz and ultimately, more minutes spent with your sales team. Familiarity with the trade show your business is attending is also crucial to nailing down the right materials for the occasion. Details as simple as where the event is being held, the size of the show, designated booth space and more. Brand’s attending events held in the open air can benefit from investing in outdoor-friendly banner and display types. From flags to banner stands, these materials work just as well indoors as they do outside, and are made to withstand the elements. A great buy for businesses who are involved in a number of trade show, conference and community event types, sturdy and flexible outdoor styles offer a lot of bang for their buck. Because size is not always directly tied to price, choosing a trade show display based on even the smallest budget– in addition to the factors listed above– still leaves an assortment of styles to decide between. Based on the brand message, audience receiving it, and the type of trade show you’re outfitting, your business can determine whether you should spring from inexpensive marketing that’s changed out on the regular or consistent longer-lasting styles to be used repeatedly. Investments that can be incorporated time and time again should take up the bulk of first time budgets, while limited-engagement pieces should make up smaller portions.